No church thinks that they are not welcoming and, no matter the denomination, each one boasts,”All are invited,” on the marquee. 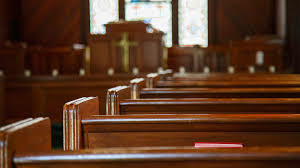 It is very simple: If a guest comes to your church and sits in any pew, is he or she asked to move because “you’re in my seat”? I’ve heard horror stories about the “Pew Test” over the years. We at Trinity have had our share of people who have visited other churches and were told to move from a certain seat. Yet, I have also learned something very important over the past decade about pews and the people who claim them. You see, when people have “my seat” in the pew, it is not because they don’t want to welcome others. It is because our Christian faith is highly experiential and tactile. It is in church that we experience conversions and born-again transformations. It is in church that we witness baptisms, baby dedications, and funerals. There, we are moved with compassion and participate in missions, inspired by God’s Word, and sing hymns that bring encouragement. We have a variety of spiritual encounters at church, and the seats in which we sit and the rituals that we practice remind us of the variety of ways that God has worked–and works–in our life. People don’t mean to be rude when they ask you to sit somewhere else; its just that that’s where they’ve sat when they have met with God so many times in their life. They want to make room for you, but not at the expense of robbing you of the chance to hear their stories, to see why the church is so meaningful to them. For all of the negative criticism related to rituals, sacred spaces, and monotonous “traditional” worship I’ve heard over the years, I’ve also heard beautiful pleas for why these elements of church-going and worship are significant to those who participate in congregational life. There is something about sacred spaces–the very pews that we fight over–that gives us opportunities to meet God again and again, week in and week out. These spaces–both physical and spiritual–are safe places that nurture stability in a world often in disarray and disorientation. I experienced this in my life in a very personal way. When my father passed away, his funeral was held in a church that has an auditorium rather than a sanctuary. There is a stage with a few musical instruments, a simple podium, and a black-curtain backdrop. It is devoid of icons, crosses, and artwork. There are no paraments or altar-clothes. There isn’t an colored antependium that implicitly communicates what season of the Christian year it is. There are no acolyte candles for children to light or communion chalices to admire, no big open Bible or ambo on a common table that remind us of the centrality of the Holy Word. The funeral was nice, but I missed my church. In that moment of sorrow, all I wanted was to sit in my seat in the front row of my church, to be surrounded by my church family, and to find encouragement in that heavy pulpit from which God’s Word had been preached for nearly three decades. I missed looking at the aged banners that adorn the church walls, the baptistry where my daughter was baptized, the baby-grand piano and the choir loft that’s home to so many familiar hymns and anthems that act as a healing balm to the heart. I missed seeing one of our children light the acolyte candles to remind me that the Holy Spirit is present with us and that all of us–regardless of age and gender–can participate in our worship to God. I missed the green antependium, green for “Ordinary Time” in the life of the church, a sign that life still goes on despite tragic loss. I finally felt the silent love of the “church ladies” sitting in the row directly behind me. I was warmly embraced by my deacon. Our pianist preached on my first day back, and his message sent our hearts aright with hope, our tears set aflame with love, and our spirits souring upon lofty places. Only in a sacred space can you experience that kind of divine interaction. Thanks be to God. Do you believe the Bible entirely true and accurate?